Built in the 18th-century, this ruined cottage recently underwent a creative redesign process that put an emphasis not on renovation or even restoration, but on preservation. Co-designed by architect Kate Darby and designer David Connor, the award-winning Croft Lodge Studio looks unlike any other small cottage house. The perfectly preserved dwelling – ivy plants, cobwebs, old bird nests, and all – now sits inside a modern envelope. The exterior features black corrugated iron over a timber and steel structure. The ruins remain untouched in the interior, which now doubles as a house and studio for Darby and Connor. The complex project aims to maintain the past very much alive. “In most places there are two walls, two windows and two roofs, old and new,” explain the two creatives. The layout also allows for further adaptations in the future. For now, the ground floor houses a double height studio, kitchen, and living room, while the upper level contains the bedroom and bathroom. Double and triple-glazed windows along with a highly insulated outer shell help to reduce the energy consumption. Solar panels as well as an ingenious pipe system that heats up the water during the summer months add to the dwelling’s green credentials. 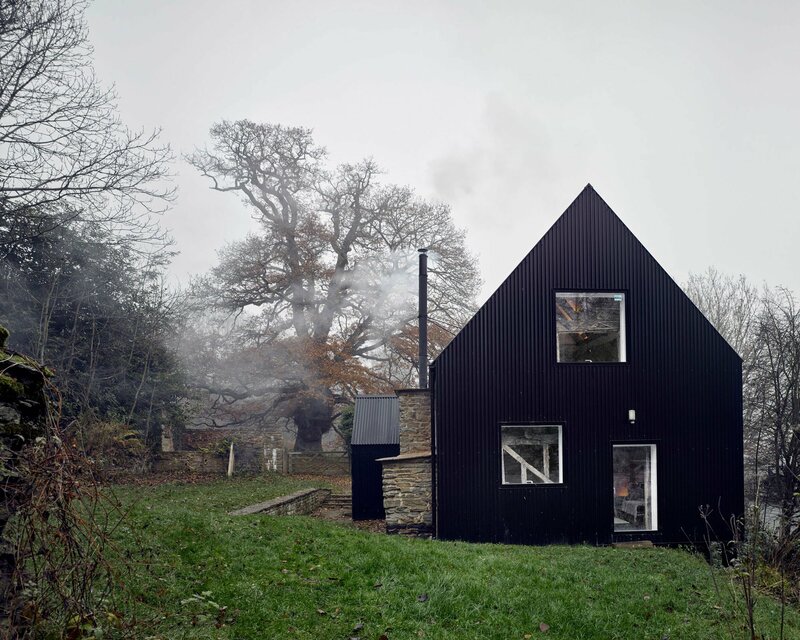 Two wood burning stoves, fueled with wood from the nearby forests, warm up the small black house during winter. One-of-a-kind and creatively designed, Croft Lodge has received various awards and mentions, from the RIBA West Midlands Regional Awards 2017 to an Architect’s Journal Small Projects 2017 Award. Photographs© James Morris and David Connor.